For the past 8 years I’ve been a solo designer, working both in-house and with some great clients that have given me the opportunity to solve problems and build great things. Over the past year, I’ve noticed my work and my design philosophy becoming more established in the principles of simple design, minimalism and clear communication. A few years ago I was looking for a name that would be the face of my design work and I landed on the name “Rocketcar” because it sounded fun and exciting. The problem was there wasn’t a lot of meaning or personal connection behind the name and its appeal ran out quickly. I firmly believe that a brand is less about one’s name or logo and more about the meaning you put behind it and how you position yourself with it. This is what I do and how I’ve made a living for almost a decade–showing people how to wear their brand well. Any designer will tell you that designing for yourself is one of the hardest things you can do–still I want to practice what I preach. In 2012, I set out to create a brand that communicates the quality of my work and my personal design philosophy to current clients, potential clients and the design community. There was an idea I had floating around in my head for a long time–something I thought would make a good t-shirt or poster–”Less is”. The idea is that you can say more with fewer words, if those words are intentional and meaningful. The principle, ‘less is more’, rings true in many areas of my life but none as much as design. I believe in building bigger messages with fewer words. 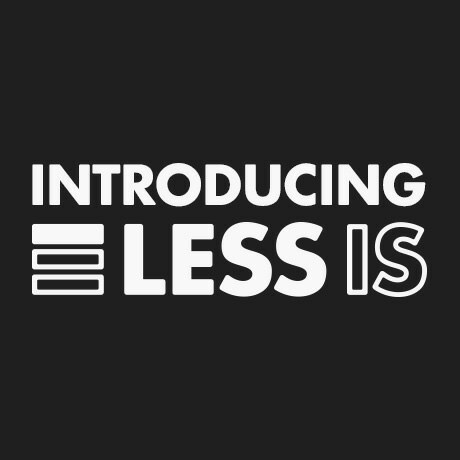 Introducing my design company’s new identity: “Less is”. The best possible solutions are often the simplest but not necessarily the most obvious. Good design is finding a solution to a problem. Great design is finding the simplest solution to the same problem. My personal goal as a designer is to communicate the value of simpler, clearer messages in our communication and in our lives.